Posted on January 11th, 2006 by jayKayEss. From the land of piano key miniskirts, heart-shaped sunglasses, sequined tops, legwarmers and midnight druids, comes ENID, a/k/a Enid Levine. 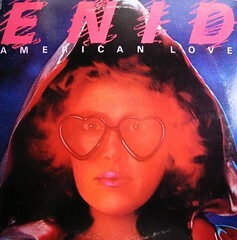 Having had a taste of the big time with a minor 80’s hit (Enid wrote the song “Hi-Fidelity” from the soundtrack of the TV show “Fame”) this is apparently Enid’s stab at even greater glory with a studio record. The results are… revealing.